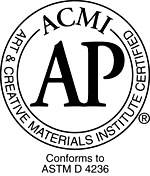 ACMI Certification Seals | Safety | Kremer Pigments Inc. The ACMI Seals certify Health Safety and Quality. We select the products of Kremer Pigments Inc. for their ability to perform with excellence in the production or restoration of art objects. Some products contain ingredients that have been shown to contain materials in sufficient quantities to be toxic or injurious to humans. To identify these products, we are in the process of submitting all materials for toxicological evaluation by the ACMI certification program. ACMI contracts with an independent team of board-certified toxicologists from the Duke University Medical Center Occupational Health Service. Headed by Woodhall Stopford, M.D., the team reviews the complete formulas of the products in the certification program. Products bearing the AP Product Seal of ACMI are certified in a program of toxicological evaluation by a medical expert to contain no materials in sufficient quantities to be toxic or injurious to humans or cause acute or chronic health problems. This program is reviewed by ACMI’s Toxicological Advisory Board. These products are certified by ACMI to be labeled in accordance with the chronic hazard labeling standard, ASTM D-4236 and Federal law, P.L. 100– 695. In addition, there is no physical hazard as defined within 29CFR 1910.1200©. 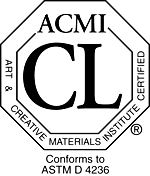 Products bearing the CL-/-HL Cautionary Label-/-Health Label (Cautions Required) Seal of The Art & Creative Materials Institute, Inc. (ACMI) are certified to be properly labeled in a program of toxicological evaluation by a medical expert. This program is reviewed by ACMI’s Toxicological Advisory Board. These products are certified by ACMI to be labeled in accordance with the chronic hazard labeling standard, ASTM D-4236, and Federal law, P.L. 100–695. We recommend when specifying or purchasing art materials, particularly for institutional use, that you carefully consider the ultimate consumer. In cases where products may be used in nursery or elementary school classes (K-6), or in environments with physically or mentally handicapped persons who may be unable to read or understand safety labeling, you should specify and purchase materials which are AP certified non-toxic products. Specification and purchase of those materials will ensure that even the most sensitive populations can safely enjoy creative art and craft activities. Other products which carry the HL-/-CL Seal and appropriate cautions for safe use, can safely be used by those persons who are able to read, understand and follow suggested safety precautions for handling those materials. Many such art products cannot be made non-hazardous, but are necessary for certain creative activities. When used in properly supervised and controlled conditions, they can be enjoyed with complete safety.